A teal band spans the upper reaches of a black-and-white snapshot of New York City at night: electric lights smolder like embers dotting the buildings and intersecting streets. There’s a sense of weightlessness—the dark rooftops standing on matrices of light; the ground obscured by the camera’s perspective. 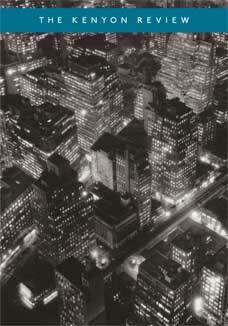 The photo, “Night View” (1936), was taken by legendary photographer Berenice Abbott as part of a series of photographs, Changing New York, published in 1939. The historic cover of this winter issue of The Kenyon Review resonates with the magazine’s contents (and publication history) in several indirect ways.Kenyon’s reputation for publishing new, emerging writers, originates in the magazine’s early days when it was founded by editor John Crowe Ransom. Incidentally, Changing New York and The Kenyon Review share the same year of first publication: 1939. Abbott’s famous subjects, aside from NYC, include artists of the 1920s French literary scene, such as James Joyce and John Cocteau. She, like Kenyon, introduced audiences to artists now widely studied in high schools and colleges across the country. Kenyon’s current editor, David H. Lynn, remarks on the magazine’s history of introducing the early work of writers, such as Robert Penn Warren, Robert Lowell, Flannery O’Connor, Rita Dove, and Ha Jin. In his editor’s notes, Lynn draws a connection between Ian McKellan’s performance as King Lear and the traditions set by Kenyon, defined by the talent within its covers. McKellan’s performance is “magical,” enduring throughout time—of all the interpretations of that tragic, complex, cruel, comic character, McKellan’s stands out the most for Lynn. And, Kenyon’s young writers conjure a similar magic through their diversity, the complexity of their work, and the immortality of print. Connections, unlikely or not, abound in Kenyon. All three stories (the winner and two runners-up), selected by Louise Erdrich for Kenyon’s Short Fiction Prize, deal in some way with familial disconnection. The winner, “Death Threat,” by Megan Malone, observes the impact of a death threat juxtaposed with the narrator’s father’s stoic exterior. However, upon hearing of the sudden death of his beloved, cruel cat, the father breaks down in tears—expanding the story’s tension into an uncomfortable epiphany. “Salt,” by Christopher Arnold, portrays a father whose addiction to salt has both envigorated his mundane life—through taste—while slowly killing him. His children are unable to grasp his love of that mineral. His son’s decision to leave the family farm further emphasizes the potential harm salt has dealt the family—with salt to spice your surroundings, complacency sets in. Finally, “Listened,” by Diana Kole, portrays a married couple on the brink of collapse. At a dinner party, the husband is rapt in a song sung by their hosts’ young daughter. Later, while in their own home, his wife accuses him of eyeing the hostess. These stories, which are really the tip of the iceberg of this dense issue, each examine relationships that are powerful and yet ordinary.Following these initial three stories, the fiction of Kenyon becomes more eclectic. Scott Russell Sanders’s “The Woman at the Grave,” is a long story of a man earnestly searching for a woman from his youth, who inspired a famous song when a snapshot of her, mourning before a grave, wound up in the hands of a folk-singer. Missed connections and second chances ensue. In “Field Guide to Monsters of the Inland Northwest,” Sharma Shield’s protagonists, a “Projectionist” and his Sasquatch wife, are embroiled in a struggle to define themselves, without relying on exteriors. Another story, “Pastoral,” by C.F. Ramuz (trans. from French by Michelle Bailat-Jones), portrays two children playing among windy hillocks. What makes this short, nostalgic (more bitter than sweet) story outstanding is that the narrator and the reader (“we”) are literally drawn into the setting, observing the children as subtle entities. Where the poetry leaves an impression, the fiction evokes subtlety. Perhaps this is because of the briefness of a poem—the necessity of keeping language present, of rendering meaning and delivery nearly simultaneous—while fiction, and this is true for short stories, allows writers to unfurl a plot and develop characters. The juxtaposition of these two literary genres (the essay feels underrepresented here) is most apparent within the pages of a magazine. What’s also apparent is that the continuation of Kenyon’s tradition—the practice of publishing high-quality work by new and established writers—conjures yet another, magical connection vivid from start to finish.